Promotes attunement to Soul energy and purpose. Will help draw towards you what you need in order to promote change and growth. Promotes a sense of calmness. Helps to heal differences in difficult relationships, particularly between parent & child. Promotes greater spiritual contact even in the darkest of situations. Helps to open, develop and balance the heart chakra. 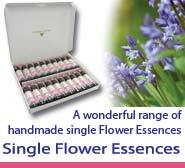 Campanula Flower Essence...Helps to promote frankness and honesty in expression, without the need for secrecy. Campion Flower Essence... Helpful for those working with emotional issues relating to pregnancy and birth. Works in the crown chakra - particularly helps attunement with the Devic orders and the Fairy kingdom.